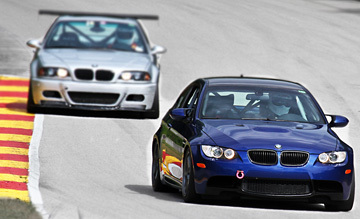 HOW WOULD YOUR BMW BENEFIT FROM AN EPIC MOTORSPORTS PERFORMANCE CALIBRATION? Modern engines have come a great distance in a very short amount of time. The combination of new technology and better components, such as, variable valve timing, Valvetronic, and forced induction result in better performance and increased fuel mileage as compared to the same displacement engines only a few years ago. One of the rapidly evolving components is the Engine Control Unit (ECU). Modern ECU’s contain new powerful processors. The processors’ performance is measured in megahertz allowing performance in millions of calculations per second. All of these advances in performance and fuel mileage are running concurrently with stringent manufacturer emissions standards. These standards are very restrictive in nature; power output is greatly affected as a result. A single vehicle model will sell 100,000+ units worldwide and each unit must meet varying countries’ emission standards. In the US, the EPA requires manufacturers to cover specified major emission control components for the first 8 years or 80,000 miles. A manufacturer cannot risk their reputation or their bottom line if they sell a car that has difficulty passing post-sale emission testing. To meet required standards, a significant margin for error is built into the calibration, which leaves power on the table. Engine sensors are built to read within certain tolerances. As these sensors age they will often degrade and the reading sent to the ECU will vary slightly. Knowing this, manufacturers err on the conservative side to help avoid emission/warranty issues by building in a margin of error. In addition to building in flexibility for ailing sensors, manufacturers are also forced to consider other wear items either from lack of service or neglect. Old spark plugs, dirty air filters, low grade fuel accidently or intentionally run through the engine are all taken into consideration when calibrated by the manufacturer. As a proponent of performance you wouldn’t do such a thing, right? When calibrating an engine, manufacturers consider all of the above-mentioned factors , which leads to a conservative end product. OEM calibrations must function in all environments and take in to account countless variables. This means they are restricted when it comes to performance. However, this also leaves great room for improvement when recalibrated in the aftermarket. At Epic Motorsports, we do not have OEM manufacturer restrictions. As a result, we are able to remap the engine calibration settings and focus more on output. This translates to better drivability, more power output, and often, better fuel economy. Our performance calibrations will increase a stock engine’s performance. As a car is modified from its stock form, the benefit from remapping becomes increasingly important and more beneficial. As restrictions are removed by adding cold air intakes, exhausts, headers, cams, et cetera, the amount of potential airflow is increased; as a result, the torque curve shifts and the ignition angle, valve timing, and the fuel curve need adjustment. Our performance calibration will maximize the benefit of your aftermarket parts and maintain drivability. Although manufacturing has become more precise there is still a large enough inconsistency from one engine to another affecting performance. It is simply the nature of manufacturing processes that some engines produce more power than others. We find that although our “off the shelf” calibrations will make sizable gains there is always room for improvement from a custom calibration. This becomes more important and beneficial the more modified an engine becomes. Through custom ECU tuning we are able to provide more usable horsepower and torque outputs by modifying BMW’s cam timing (VANOS), fuel maps, and ignition maps. The rev limiter can be set between 7000-7400 rpms depending on cam choice. Optional custom software for larger airflow meters, headers, larger cam shafts and bigger injectors is available. Rear O2 sensor and other emissions monitoring can be disabled upon request for race cars and/or off-road use only vehicles. Through custom ECU tuning we are able to provide more usable horsepower and torque outputs by modifying BMW’s dual (99-05) variable cam timing (VANOS), DISA (99-05), and fuel and ignition maps. Better part-throttle drivability is also obtained. The engine rev limiter is raised to 7000 RPM’s and the vehicle’s top speed governor is removed. Custom software modifications for headers or other modifications are also available. Rear O2 sensor monitoring can be disabled upon request for race cars and/or off-road use only vehicles. Through custom ECU tuning we are able to provide more usable horsepower and torque outputs by modifying BMW’s dual variable cam timing (VANOS) and fuel and ignition maps. Better part-throttle drivability is also obtained. The engine rev limiter is raised to 7000 RPM’s and the vehicle’s top speed governor is removed. Custom software modifications for headers or other modifications are also available. Rear O2 sensor monitoring can be disabled upon request for race cars and/or off-road use only vehicles. Through custom ECU tuning we are able to provide more usable horsepower and torque outputs by modifying BMW’s dual variable cam timing (VANOS), throttle, and fuel and ignition maps. Better part-throttle drivability is also obtained. The engine rev limiter is raised to 7200 RPM’s and the vehicle’s top speed governor is removed. Custom software modifications for headers or other modifications are also available. Rear O2 sensor and other emission monitoring can be disabled upon request for race cars and/or off-road use only vehicles. Through custom ECU tuning we are able to provide more usable horsepower and torque outputs by modifying BMW’s dual variable cam timing (VANOS), DISA, and fuel and ignition maps. Better part-throttle drivability is also obtained. The engine rev limiter is raised to 7000 RPM’s and the vehicle’s top speed governor is removed. Custom software modifications for headers or other modifications are also available. Rear O2 sensor monitoring can be disabled upon request for race cars and/or off-road use only vehicles. Through custom ECU tuning we are able to provide more usable horsepower and torque outputs by modifying BMW’s dual variable cam timing (VANOS), throttle tables, and fuel and ignition maps. Better part-throttle drivability is also obtained. The vehicle’s rev limiter will be raised to 8200 and the top speed governor will be removed. Custom software modifications for headers and disabling emissions control devices (off-road use only), alpha-n for carbon intake plenums and/or camshafts can also be made. We can also add the SMG shift lights to your 6-speed car. Our Race software was developed through years of on-track data logging and dyno tuning to extract every last horsepower and remove all the common problems associated with running a S54 on the race track without compromising reliability. This software can be customized for stock or fully race built engines. Through custom ECU tuning we are able to provide more usable horsepower and torque outputs by modifying BMW’s dual variable cam timing (VANOS), drive by wire tables, and fuel and ignition maps. Better part-throttle drivability is also obtained. The vehicle’s top speed governor is removed. Custom software modifications for headers or other modifications are available. Through custom ECU tuning we are able to add over 80hp and 110ft/lb of torque in addition to improving drivability by increasing boost output, modifying BMW’s dual variable cam timing (VANOS), drive by wire tables, and fuel and ignition maps. The vehicle’s top speed governor is removed. Custom software modifications for catless downpipes are also available for off-road use. Through custom ECU tuning, we are able to add over 80 hp and 110 ft/lb of torque in addition to improving drivability by increasing boost level, modifying BMW’s dual variable cam timing (VANOS), drive by wire tables, and fuel and ignition maps. The vehicle’s top speed governor is removed. Custom software modifications for catless downpipes are also available (for off-road use). Through custom ECU tuning we are able to add over 40hp and 80ft/lb of torque in addition to improving drivability by increasing boost output, modifying BMW’s dual variable cam timing (VANOS), drive by wire tables, and fuel and ignition maps. The vehicle’s top speed governor is removed. Custom software modifications for downpipes and a larger intercooler are also available. Through custom ECU tuning we are able to provide more usable horsepower and torque outputs by modifying BMW’s dual variable cam timing (VANOS), drive by wire tables, and fuel and ignition maps. Better part-throttle drivability is also obtained. The engine rev limiter is raised to 7000 RPM’s. Rear O2 sensor monitoring can be disabled upon request for race cars and/or off-road use only vehicles. Through custom ECU tuning we are able to provide more usable horsepower and torque outputs by modifying BMW’s dual variable cam timing (VANOS), DISA, and fuel and ignition maps. Better part-throttle drivability is also obtained. The engine rev limiter is raised to 7000 RPM’s and the vehicle’s top speed governor is removed. Custom software modifications for headers or other modifications are available. Through custom ECU tuning we are able to provide more usable horsepower and torque outputs by modifying BMW’s dual variable cam timing (VANOS), drive by wire tables, and fuel and ignition maps. Better part-throttle drivability is also obtained. The engine rev limiter is raised to 8200 RPM’s. Rear O2 sensor monitoring can be disabled upon request for race cars and/or off-road use only vehicles. Through custom ECU tuning we are able to add over 40hp and 80ft/lb of torque in addition to improving drivability by increasing boost output, modifying BMW’s dual variable cam timing (VANOS), drive by wire tables, and fuel and ignition maps. The vehicle’s top speed governor is also removed. Custom software modifications for downpipes and a larger intercooler are also available.